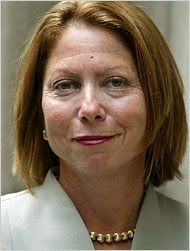 the nytpicker: Live-Blogging Jill Abramson: "The Times Was Prescient About Key Elements Of The Crisis Years Ago." Live-Blogging Jill Abramson: "The Times Was Prescient About Key Elements Of The Crisis Years Ago." The second questioner in Jill Abramson's "Talk To The Newsroom" wants to know whether newspapers plan to commit more money to investigative journalism, now that it turns out they all missed the biggest story of our lifetime. "Following the enormous miss on the Judith Miller weapons of mass destruction reporting, and the overall deafness of all major papers to the financial crises we are now in," asks Rebecca Katechis, "what specific steps were/will be taken in the newsroom to improve the verification of information and the scope of reporting?" Good question, but Abramson isn't going to concede the point. "I commend to you our ongoing series, The Reckoning, which is a splendid example of accountability journalism," Abramson says, right off the bat. She then concedes that as an investigative reporter herself, "I'll confess that a frustration of mine has always been that so much investigative journalism involves a dissection of events in the past." But while Abramson acknowledges that "The Reckoning" is explaining past events, she says the paper's goal is to offer "an ongoing investigation of what went wrong and who is accountable and to do this journalism in real time," whatever that means. "We are tracking the way the bailout money is being spent and have a full-time reporter in Washington, one of our best investigative reporters, assigned to cover this subject as a beat. Our banking reporters are also on the case." The banking reporters are on the case! We feel better already. While some in the media may not have seen it coming, The Times was prescient about key elements of the crisis years ago. Gretchen Morgenson, among others, was writing about the dangers of many of the more exotic financial instruments long before housing prices began to plummet. It is true that Morgenson wrote a prescient story less than two years ago, "Mortgages May Be Messier Than You Think," in which she ominously declared that "trains wrecks are train wrecks, even when they occur at a crawl." But even Morgenson's business-section colleague, David Carr, gave primary credit in a widely-noted column this fall to NPR producer Alex Blumberg for being the first to question the folly of banks' freewheeling mortgage-lending policies. But that won't keep Abramson from bragging about her business-reporting staff. "There aren't that many investigative journalists with real business acumen," she says, "and The Times is lucky to have a solid group of these reporters." Two years ago? Try reading Stephen Holmes's piece from almost 10 years ago!